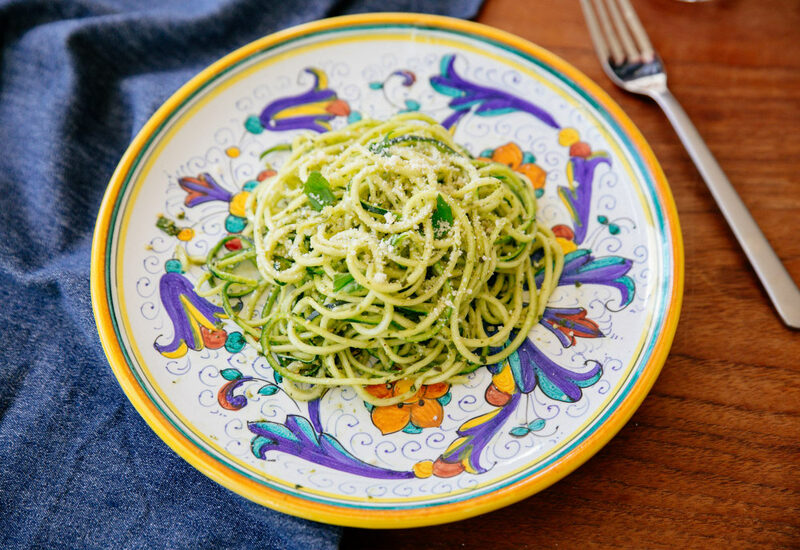 Tradition meets innovation in this recipe that matches homemade basil pesto with spiralized zucchini zoodles for a fresh, low-carb version of a favorite pasta dish. Make the pesto in batches and store in the freezer in small (2 to 4 ounce) containers. When you're ready to make this recipe, let the pesto thaw at room temperature. Per Serving: 352 calories; 34g fat; 8.1g carbohydrates; 7g protein; 11mg cholesterol; 497mg sodium. I wasn't sure about leaving the zucchini raw, but it totally works in this recipe. You could definitely pack this for a lunch or picnic. It's very bright and full of summer. I may just be a sucker for basil pesto, but I can also live with that! 4 stars because my roommate was really into this and cleaned her place. I wasn't a huge fan of the zucchini noodles, but I'm still trying to get used to it and make healthier choices. However, adding more parmesan cheese to the pasta made this palatable for me. I made the pesto ahead of time but made the mistake of not letting it thaw to room temperature. Other than that, this was a great recipe. Lots of cheese is good! Yummy recipe! I did sauté the zucchini just for 2 or 3 minutes to heat through. I really liked the way it turned out, great for a quick and easy dish. Especially if you already have pesto made. Love this classic basil pesto recipe! I've made it to go with spiraled zucchini as well as spaghetti pasta when I don't mind the carbs. I usually double the pesto ingredients to make twice the amount. It stores perfectly in the fridge.